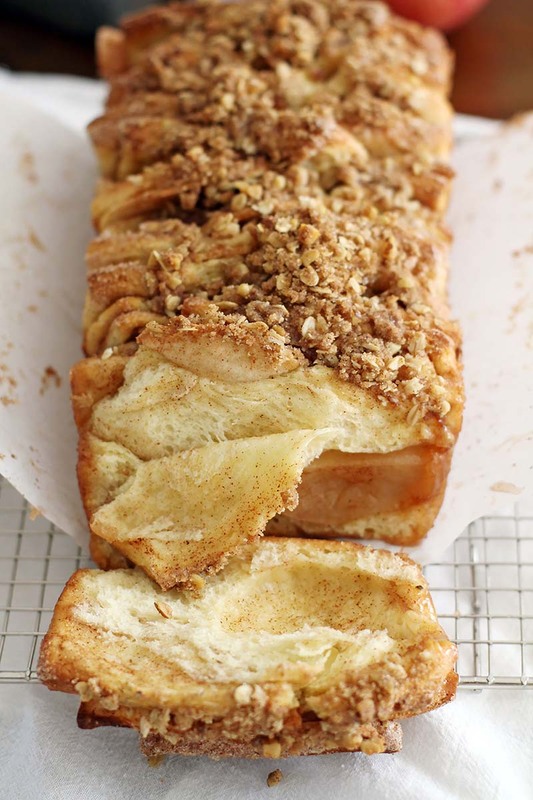 This Apple Cinnamon Streusel Pull-Apart Bread combines fresh apples, melted butter and a sweet cinnamon-sugar filling tucked between slices of soft bread. With a crumbly, sugary streusel to top it off, it's a deliciously comforting fall baking recipe you'll want to make for you, your family and your friends again and again. (1) In a medium saucepan over medium heat, heat butter and milk just until butter is melted. Remove from heat and stir in vanilla. Cool mixture to 115 to 125°F. (2) Meanwhile, in a small bowl, whisk 2 tablespoons sugar with the warm water until dissolved. Whisk in yeast and let sit 5 to 10 minutes until foamy. (3) In a large bowl, whisk remaining 6 tablespoons sugar with 4 cups of flour and salt until combined. Add butter-milk mixture, yeast mixture and eggs. Stir with a spatula or wooden spoon until a dough forms. (4) Add another 1½ cups of flour and continue to stir with a spatula or wooden spoon until a smooth, but rather sticky dough forms (it will be a little stickier and looser than normal; this is OK). Shape dough into a loose ball in bowl; cover bowl with plastic wrap. Place bowl in a warm place and let dough rise 1 to 1½ hours until doubled. (5) Meanwhile, in a small bowl, whisk sugar, cinnamon and nutmeg for the filling until well combined. (6) Punch down risen dough. Add remaining ¼ cup flour and knead into dough, either in the bowl or on a countertop. Let dough rest 5 minutes, covered with a clean kitchen towel. At this point, you can return the dough to the bowl, cover it with plastic wrap and refrigerate it overnight – just let it sit out at room temperature for about 40 minutes the next day before rolling out the dough. (7) Otherwise, proceed with rolling out the dough. Divide dough into 2 equal-sized pieces. On a lightly floured surface, shape one piece of dough into a rough rectangle. Use a floured rolling pin to roll out dough to a 20-by-12-inch rectangle. (8) Brush dough with half of the butter, then sprinkle evenly with half of the sugar-cinnamon mixture. Use a pizza cutter or sharp knife to cut dough north to south in 6 even strips. Stack strips on top of each other (if some of the filling falls off, just spoon and smooth it back on top as best as you can). Cut stack into 6 even stacks of squares. (9) Line two 9-by-5-inch loaf pans with parchment paper, then spray with baking spray or brush with butter. Prop up loaf pan and carefully stack a few squares into pan at a time, tucking a few slices of apple between dough squares as you go (you’ll want to divide the apple evenly between the two loaves). * Unprop loaf pan and cover with a clean kitchen towel while you prepare second loaf the same way with remaining butter, sugar-cinnamon mixture and sliced apples. (10) Cover both prepared loaves with a clean kitchen towel and let rise 30 to 45 minutes until doubled. (11) Meanwhile, heat oven to 350°F. In a medium bowl, combine all ingredients for streusel topping except for butter. Using a pastry cutter or your fingers, cut in cold butter until mixture resembles coarse crumbs. Place bowl in fridge until loaves are doubled and ready to bake. (12) Uncover risen loaves. Sprinkle streusel evenly over tops of loaves. Bake loaves 40 minutes until tops of loaves are a deep golden brown (you want them to be well-baked on top so the center is baked through). (13) Transfer baked loaves to a cooling rack and let cool 30 minutes in loaf pans. Then, carefully lift loaves out of pans, using parchment paper as handles. Serve warm or room temperature (loaves taste best the day they are made, but they can be stored, covered with plastic wrap and foil, at room temperature up to 3 days). *Depending on how many apple slices you have/use, you might not be able to use all of the dough between the two loaf pans. You can either use the extra dough to make a third loaf, or just discard it. Hey! First time baking something like this and i was a bit confused by the wording on the assembly! Took me awhile but i figured it out and wanted to shar it in case anyone was in a position like me! When it says cut north to south, cut it long ways. Then when it says stack the strips on top of eachother you would be folding the strip on top of it’s self like accordion style from when you were young! tucking in apples as you are folding. then you stack these peices into the pan long ways and that is why you need to prop it up! I hope this helps anyone else who is confused!! This bread was amazing!It was a hit with my daughter, husband, grandma, and aunt! Yes, it does take some time and patience but it is not the hardest recipe to make. Follow the instructions and you will be okay. hi!im baking it right now, and i got to tell you, this whole house smells absolutely scrumptious!! it is a bit involved, but so worth it for the amount it makes and taste. Ive never had such a good home made pull apart bread. I even added roasted crushed pecans to the crumble and giving that a go. Also, i mixed in a little cinnamon/sugar mixture onto the apples along with a squirt of lemon juice…I found that i needed about 3 normal sized apples for everything, or at least 2 large (even cut thinly!). Also, the most interesting thing i adjusted was i made some brown butter for when you spread melted butter onto the dough, just to give it a more nutty taste and add some depth to the flavor. Good luck anyone who tries this out!! Hi Lisa, I’m a vey visual learner. Have you considered doing a video? Thanks, this looks tasty. Not sure why someone is rating a recipe a two without even trying it, so I, thinking it at least looks fabulous, will give it a five star rating to even out the two stars. I am a first time baker of breads this seems pretty easy until the part of rolling out the dough into pieces and assembling it I’m gonna try it cause it sounds so good I will let you know how it turns out I hope this wasn’t too ambitious for me to try. This is definitely a more involved recipe, but I hope you were successful!